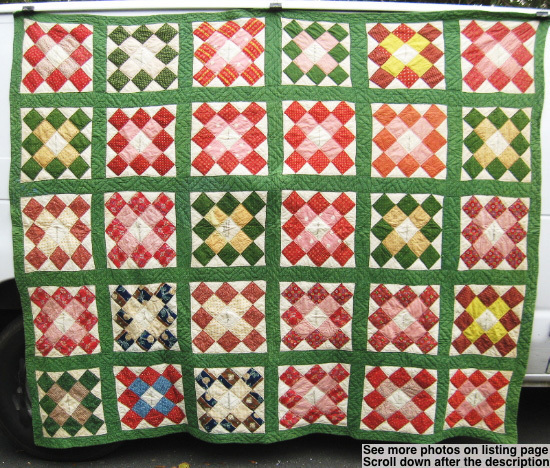 chimney album signature quilt from Hunterdon County, New Jersey. I'll post some close-ups below. Main surname is Hoppough and was likely made for Elizabeth Hoppough whose name and birth date of 1835 are listed in a center block and her parents are also on the quilts as well as their next door neighbor Elizabeth Neighbor (no, I can't make this stuff up). Don't you love this heart fabric ! Here's the dedication block for Elizabeth Hoppough who was born in 1835 in Hunterdon Co, NJ. -Western New Jersey next to Pennsylvania. You can see the chrome orange dye was not stable. Too funny about the neighbor named Neighbor! Love that blue carnation fabric.